Three-time Super Bowl winner Rob Gronkowski has announced his retirement from American football. The 29-year-old played for the New England Patriots throughout his nine-year career and played a part in 2014, 2016 and 2018 wins in the NFL's showpiece. 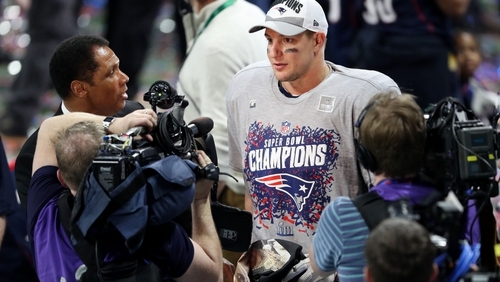 Known as 'Gronk', the tight end announced his retirement on Instagram, saying: "It all started at 20 years old on stage at the NFL draft when my dream came true, and now here I am about to turn 30 in a few months with a decision I feel is the biggest of my life so far. "I will be retiring from the game of football today. I am so grateful for the opportunity that Mr. Kraft and Coach Belichick gave to me when drafting my silliness in 2010. "My life experiences over the last nine years have been amazing both on and off the field. "The people I have met, the relationships I have built, the championships I have been a part of, I just want to thank the whole New England Patriots organisation for every opportunity I have been given and learning the great values of life that I can apply to mine." Gronkowski finishes his NFL career with 521 receptions, 7,861 receiving yards and 79 touchdowns and holds the record for most receiving yards for a tight end in the post-season with 1,163.